I’ve realized after this trip that 3 days is the perfect amount of time to spend in Madrid. The city isn’t that big and the most popular thing to do is it sit outside and eat tapas (which you can really only do for so long). 3 days is also the perfect amount of time for a solo trip. While I love being alone and experiencing a new city on my own terms, by the last day I was starting to miss my friends and life’s connections. I spent my last day in Madrid wandering the streets, eating and shopping and taking pictures. The weather was amazing and led to a perfect ending of a beautiful trip- Madrid I’ll definitely be back! The El Rastro flea market is only open on Sundays beginning pretty much as soon as the sun rises. It was located right near my hostel so I walked through the already crowded streets perusing through various knick knacks, clothing, and souvenirs. I wished I had brought a bigger suitcase so I could have actually bought some of the stuff! 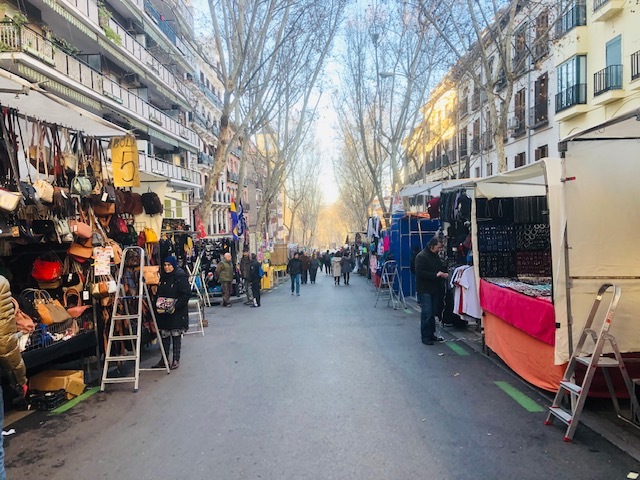 I saw the cutest faux fur coats, vintage telephones, Madrid themed silverware, and handmade jewelry, Many streets are blocked off from cars so taking a walk through the flea market was a great start to my day. I luckily made it through before the even bigger crowds arrived because I could see how pickpocketing could be a problem here. La Infinito was heavily recommended on many searches I conducted about the Madrid food scene so I made a quick stop here after walking through the flea market. Something I’ve noticed about many restaurants is that there is always an English menu if you just ask- La Infinito was no different. 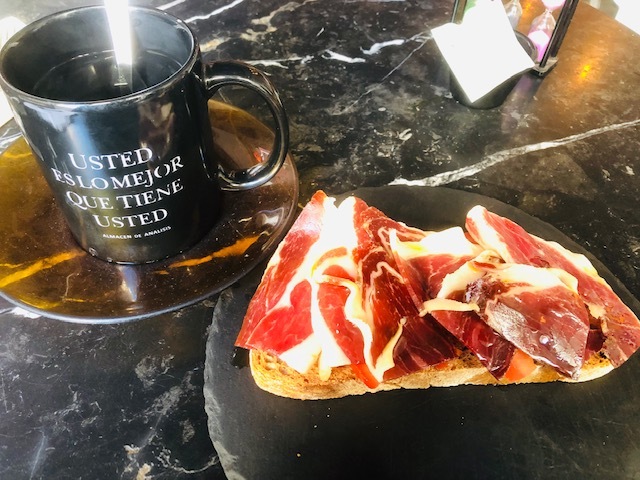 Although the English menu wasn’t a super clear translation, I was able to finally order the Iberico ham (otherwise known as Jamon Iberico) and try it on top of tomato bread as many Spanish eat it. The set breakfast also came with a calming tea. I felt like a local dining in this little slice of a quiet Madrid neighborhood. I wanted to try Madrid’s coffee scene at least once before leaving so after searching online for a decent coffee shop that was open early and located around the area of the flea market (I had grand plans to sip my latte while meandering through the many streets of the flea market) I finally found Ruda Cafe. To my surprise (but should I really have been surprised? ), Madrid cafes are not open that early on the weekends. Many places didn’t open until 10am… which is a huge change from New York coffee shops that open literally at the crack of dawn even on the weekends. Ruda Cafe is located on a side street about 5 minutes from the main street of the El Rastro Flea Market in a tiny hole in the wall looking storefront. 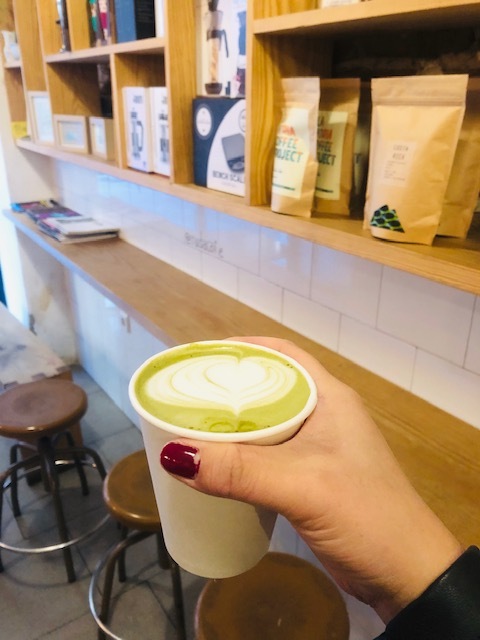 My matcha latte was delicious and not too bitter (a problem I find with many matcha lattes). I loved how warm it was in my hands as I perused the flea market items. One of my favorite things to do in a new city is to see the view of the city from up above. Circular de Bella Artes is actually an art gallery, but has a rooftop cafe up top that is known for its gorgeous views of Madrid. There is a 4 Euro fee to visit the rooftop (even if you plan on ordering a drink at the cafe), probably because too many take advantage of the views without purchasing anything. 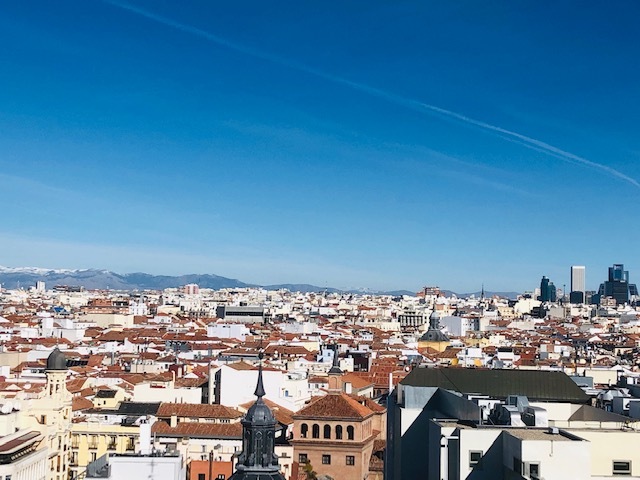 I got to the rooftop right when it opened so it wasn’t too crowded yet and I was able to leisurely stroll around the barriers taking pictures of and experiencing Madrid from all angles. It was a beautiful sunny day and I felt like life was grand just viewing everything on that rooftop! 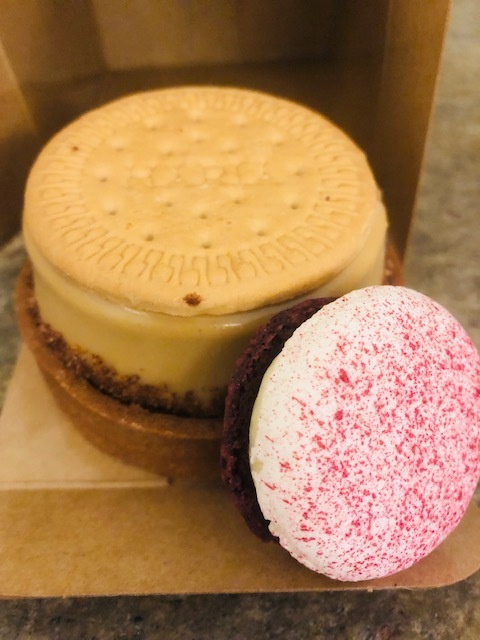 I made a pit stop at the adorable Mama Framboise pastry shop to try their berry yogurt macaroon and caramel biscuit tart. I wish I had more stomach space because I would have also loved to have a second brunch here and try their brunch menu. The cafe was packed with customers and I could barely grab a side bar space to sit down and eat my desserts. This place is so worth a stop- the pastries were SO delicious! I didn’t read the website clearly and realized after I had already purchased my nonrefundable ticket that all tours of the monastery were only held in English so while I could not understand a single word the tour guide said, I throughly enjoyed walking through a centuries old monastery and looking at their priceless art collection (and also looking everything up on Wikipedia afterwards). I definitely wish I had brushed up on my Spanish skills before going on the tour because it totally sucked not being able to hear the elaborate stories the tour guide was telling (and I do know they were elaborate because she talked A LOT and everyone was laughing… except me). The Monastery is actually affiliated with the Spanish royal family and founded by a Princess Joanna in 1559. It is filled with paintings, tapestries, and statues so if art is your cup of tea and you are tired of visiting art museums, then this Monastery should be right up your alley. Just be prepared to listen to a Spanish only tour guide! 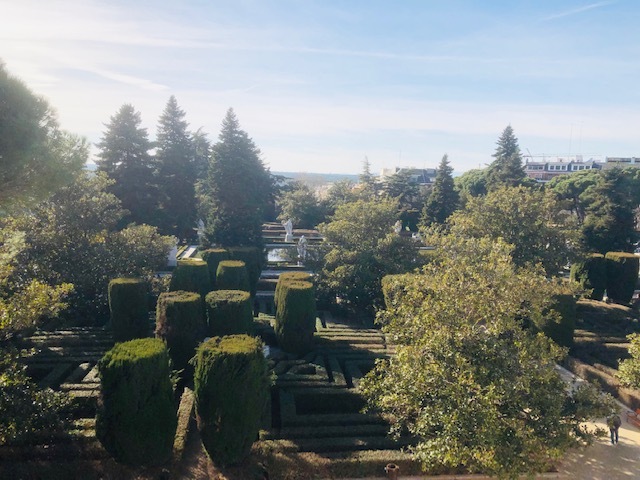 This garden was a surprise find on my walk to the Temple Debod. It is located to the side of the Palace and offers free entry to all visitors. I wasn’t sure if this was part of the Palace or if it was a separate garden, but its nevertheless beautiful! Be prepared to climb up and down a ton of stairs to reach this garden though. I originally wanted to come here for the sunset, but was so exhausted from all the walking and sightseeing I had been doing over the past two days that I decided to just go ahead and visit earlier and then call it a day and go back to the hostel. 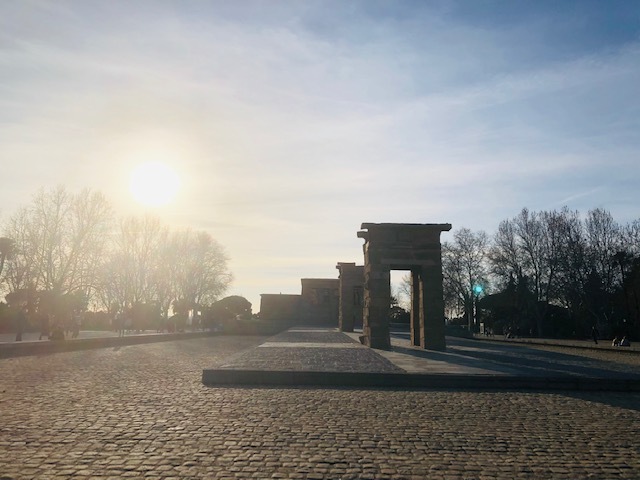 So while I wasn’t able to get those breathtaking sunset photos, I still enjoyed the free spirited park the Temple is located in and loved sitting on the benches and the edge of the Temple Debod and people watch. The Temple does get crowded the closer it gets to sunset (I saw hoards on people arriving while I was leaving) so if you want to avoid the crowds and enjoy a more peaceful scenery then I highly suggest arriving earlier as well. Also fun fact- there is another Egyptian temple very similar in appearance to the Temple Debod located in the Metropolitan Museum called the Temple Dedur that is also worth a visit! This was probably the only time during the whole trip that I wished I had someone else there with me. Only because the food at Malaspina was SO GOOD and I was sadly unable to finish all of it just because the portions were too big for one person to eat. I ordered the homemade ham croquettes and the patatas bravas and stuffed myself until I thought my stomach would burst. If I had another person there I would have definitely enjoyed more items off the menu, but since I was by myself my meal of croquettes and potatoes was a fabulous last meal of tapas in Madrid. Malaspina is located on a back street in the center of Madrid and it is surrounded by tons of other bars and tapas restaurants so if I had more time (and stomach space) I would have loved to tapas hop and taste more of what Madrid had to offer culinary wise. This was my last day in Madrid and it was the most peaceful day! 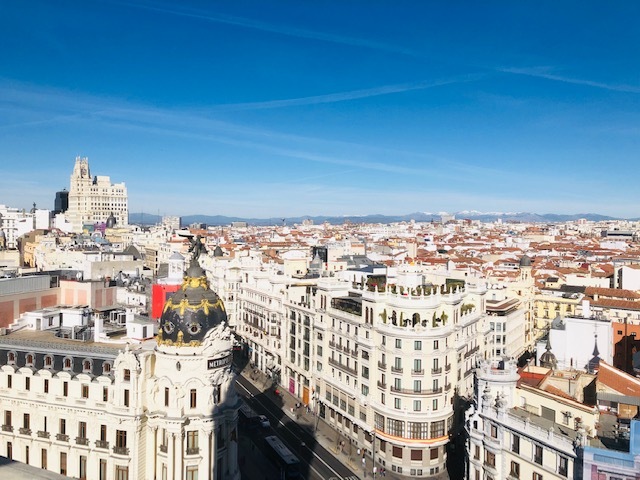 I truly appreciated the quiet beauty of Madrid and can’t wait for a return trip. Now it is off to Portugal for a 9 hour layover!